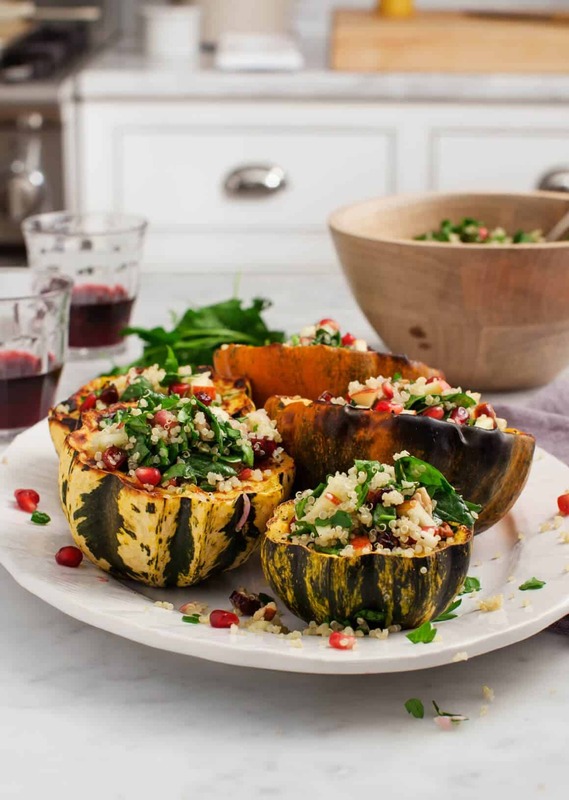 Quinoa Salad Stuffed Acorn Squash is a healthy vegetarian Thanksgiving main dish. Ok, so if you really know your vegetables, you’ll notice that those guys in front are actually Jester Squash and not Acorn Squash. Technicalities aside, they work just as well for roasting and stuffing. Something I really love about my local Farmhouse Delivery is that vegetable varieties show up that even I – the girl that literally wrote a book about vegetables – have to occasionally Google. 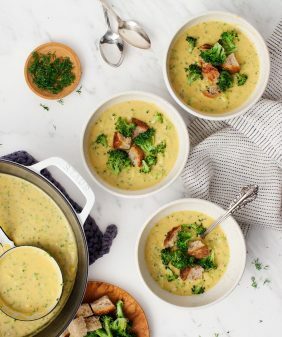 This recipe is comfort food on the lighter side. 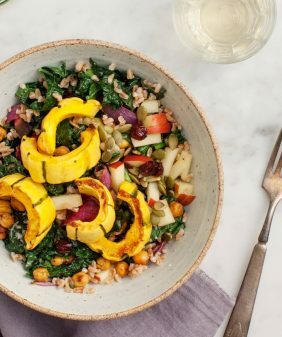 Sometimes fall foods make me feel just so darn full, so what I did to avoid a near-food coma situation was stuff the squashes with a light & bright quinoa salad. Serve these to your veggie friends at Thanksgiving, or make them for yourself on a weeknight. The salad can be made ahead of time, so this recipe is really pretty easy to throw together. Step 1: Scoop out and roast the squash. Step 2: Make the salad. This one is made with quinoa, spinach, apples, pomegranates, and toasted pecans. It’s tossed with a zippy lemon-shallot-dijon vinaigrette that I make at the bottom of the bowl before adding the rest of the salad ingredients. 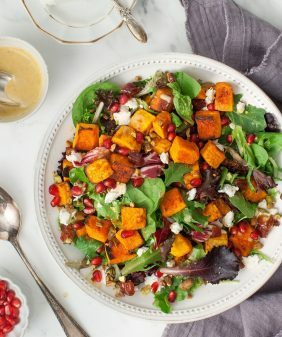 Since this recipe is half-salad, I suggest serving it at room temperature with an extra drizzle of olive oil or (optional) the maple-tahini sauce from this recipe. If you’re not vegan, some crumbled feta cheese would be delicious. Preheat the oven to 400°F and line a baking sheet with parchment paper. Slice each acorn squash in half and drizzle with olive oil, balsamic vinegar, and sprinkle with a few generous pinches of salt and pepper. Place the squash cut side down on the baking sheet. Roast until the squash is tender when pierced with a fork, about 40 minutes depending on the size of the squash. Halfway through, flip the squash so that it's facing cut side up. 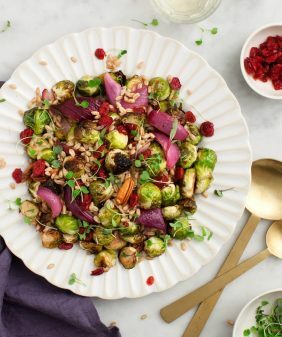 In a large bowl, combine all the salad ingredients - the olive oil, shallot, garlic, mustard, lemon juice, quinoa, spinach, parsley, apple, pecans, and cranberries - and mix well. Season to taste. 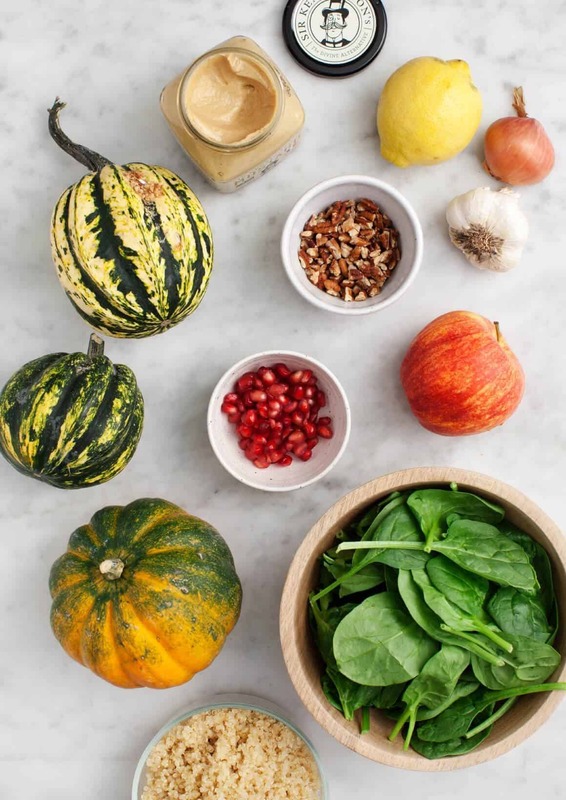 Fill the acorn squash halves with the salad and drizzle each with olive oil, or serve with tahini sauce, if desired. tip: whenever I make stuffed squash, I like to slightly over-season the filling so that it's still very flavorful when you eat it together with the squash. Crumbled feta cheese would also be delicious here! This dish is home cooking on the lighter side. Often fall foods make me really feel so darn full, so what I did to prevent a near-food coma situation was stuff the squashes with a light & bright quinoa salad. I served these to my veggie friends on Thanksgiving. 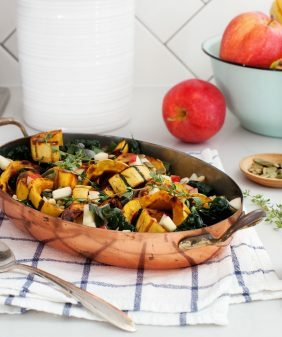 I love fall foods, but they make me so darn full sometimes too. Haha! I have no idea why. 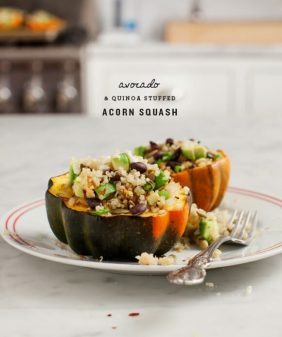 I love winter squash including acorn squash and I’ve been loving quinoa a lot lately. This is perfect for Thanksgiving or any fall gatherings. This was s crowd pleaser for both my vegetarian and hunter in-laws when they were visiting around Thanksgiving. It was easy to make, delicious and filling.